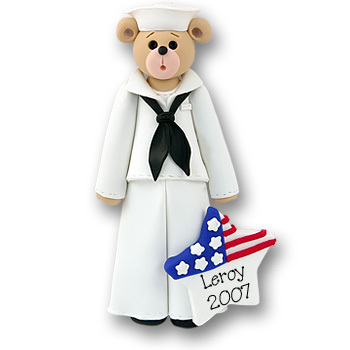 Finally after many requests we are proud to offer you our exquisitely detailed Belly Bear Sailor. This personalized ornament is a great gift for that special person in your life that you are so very proud of. Once again reminding us...Home of the free...Because of the Brave!! Designed and lovingly handmade from polymer clay by Debi Allison.